St Helier Hospital is, once again, under threat. Epsom and St Helier University Hospitals NHS Trust are running yet another engagement that could see acute services including major A&E and consultant led maternity services lost from St Helier Hospital, Epsom Hospital, or both hospitals from 2020. I am wholeheartedly against these proposals. Along with the local community, I have consistently campaigned for a fully operational and improved St Helier Hospital: keeping the hospital’s services at the heart of our community for the residents that rely on it. One proposal is to improve St Helier on its current site. I would absolutely welcome any investment in St Helier Hospital, though I am concerned that there is no budget set aside for this and Daniel Elkeles, the Chief Executive of the Trust who is running the engagement, has even said privately that this is not his preferred option. He would like acute services to be based next to the Sutton Hospital site in Belmont rather than at St Helier Hospital. The statistics could not be clearer: the health needs of those living near St Helier Hospital are far, far greater than those living in either Epsom or Belmont. Moving acute services to these areas would be a case of taking them from an area of poor health to an area of considerably better health. That, I believe, would be absolutely wrong. We have, of course, been here before. 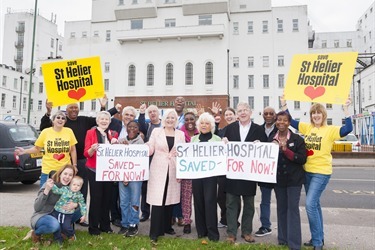 Consultation after consultation over the past 18 years have all identified the best outcome for these proposals to be improving St Helier Hospital. £37,070 has already been spent by the Trust on this new engagement process - funds that I believe should be spent on improving the hospital itself. I will do all I can to shout about this issue, but I need your help! Please write to the Trust expressing your views. I will be writing to the Trust to argue that St Helier should remain fully operational on its current site. The official consultation email is: esth2020-2030@nhs.uk. The deadline is 30th September. Please send a copy of your letter to Siobhain@mmlp.org.uk or by post to 1 Crown Road, Morden, SM4 5DD. Please tell all those you can about this engagement so that the voices of Mitcham and Morden can be heard lour and clear. Share my videos on social media, encourage them to join us at our public meetings, ask them to write to the Trust. St Helier Hospital should remain fully operational on its current site. Any funds available should be spent on the hospital and not on yet another consultation.